Interior mats can provide the perfect accent in a generic office space, injecting color and texture into the design scheme. But interior mats don’t just look pretty; they play an essential role in maintaining the cleanliness and sanitation of commercial properties. So when picking materials, consider these factors for choosing the most durable and fuss-free option for your facility. Placing a mat at entrances and exits may seem an obvious choice. But well-placed interior mats throughout the facility can keep working spaces clean and hygienic. Place your mats both inside and outside entrances. They also prove particularly useful at high traffic transitional areas, such as walkways, stairs and elevators, absorbing excess dirt and moisture while shielding the flooring below – making clean-up both quick and efficient. Mats are also crucial for food services areas, such as the office kitchen or cafeteria, to add a barrier of protection for everyday spills. 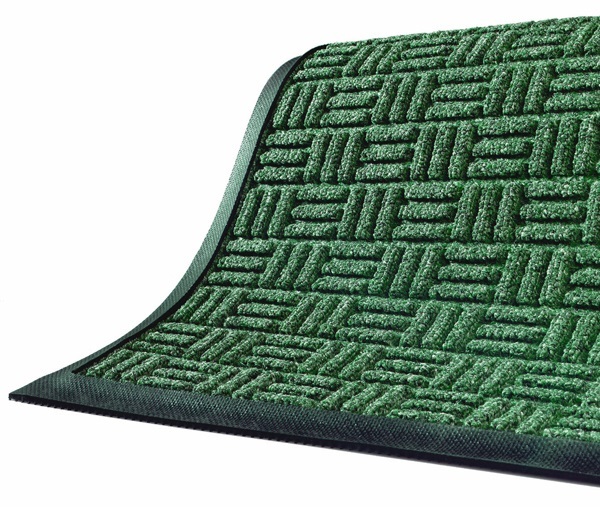 The U.S. Green Building Council and the Carpet and Rug Institute recommend using high performance matting, which can capture as much as 85 percent to 95 percent of contaminants that enter the building, saving maintenance dollars and protecting building assets. Consider consulting with your cleaning service provider to pinpoint vulnerable areas. For interior mats in office spaces, attractiveness is moot without easy maintenance. Choosing the right fiber can provide the best of both worlds. Though the most expensive, nylon’s resilience makes it ideal for public spaces. Nylon can also be boosted with stain-resistant and hypoallergenic treatments. Microfiber and polypropylene (olefin) blends provide a less expensive, but effective option, thanks to its high dust and moisture retention. Polypropylene fibers often have the added benefit of being environmentally friendly, as many brands use recycled raw materials. Several manufacturers use 100 percent post-consumer recycled PET fibers, sourced from plastic bottles that include lifetime guarantees. When picking materials, also opt for low density models for an easier clean. Selecting the right fibers is important, but what’s behind your mat can prove just a crucial. Backing helps keep interior mats in place, avoiding slips and slides. Some of the most effective and environmentally friendly backings are made from recycled rubber from car tires or Nitrile rubber, which prevents degrading, discoloring and staining. Vinyl backings, such as Thermoflex, can also provide the slip security without the unsightly discoloration that can occur with some other materials.